﻿A brand new TEN MINUTE routine for your Christmas show that packs flat, plays big and will have the kids on the edge of their seats! 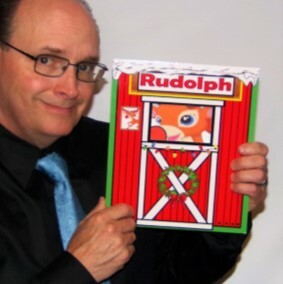 Eventually, his nose turns red again, and you begin to have all the kids sing 'Rudolf the Red Nosed Reindeer', but stop when you get to the line 'They never let poor Rudolph join in any reindeer games.' And, the fun continues! Rudolph takes offence to being left out of reindeer games. You introduce two of Rudolph's friends Dasher and Dancer and play a game of hide and seek! Try as they may, the children can never find Rudolph. Then he disappears altogether! The cards are printed on triple layer trifecta stock. 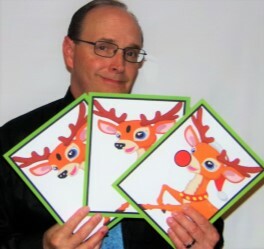 The colour changing Rudolph card is cleverly gimmicked and very easy to operate.